I’ve been throwing around the idea of writing a book for the past few months, but I wasn’t sure on what the exact focus was going to be. I’ve given it a ton of thought, worked out the specifics, and spoke with a lot of developers, programmers, and researchers like yourselves. All of this work has lead up to today — the announcement of my book. 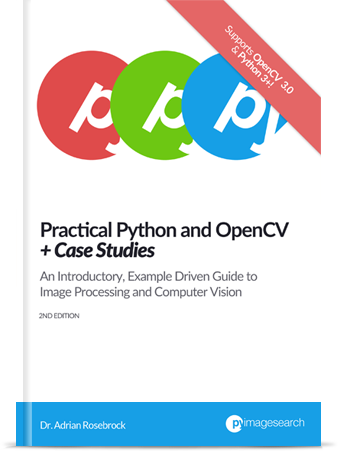 Practical Python and OpenCV: An Introductory, Example Driven Guide to Image Processing and Computer Vision covers the very basics of computer vision, starting from answering the question “what’s a pixel?” and working your way up to more challenging tasks, like edge detection, thresholding, and finding objects in images and counting them. Sign-up to receive an awesome pre-release deal when the book launches. 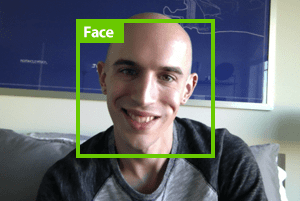 A hands-on introduction to computer vision and image processing. Lots of visual examples, lots of code to get you started quickly and easily. A downloadable VirtualBox virtual machine that has all the computer vision and image processing libraries you will need pre-installed. An accessible book written for developers, programmers, and students who are looking to learn the fundamentals of computer vision and image processing. I’m also considering creating a series of screencasts where I take apart each example in the book and explain line-by-line what the code is doing. If you are interested in this, please shoot me a message. This book is tremendously example driven. When I first set out to write this book, I wanted it to be as hands-on as possible. I wanted lots of visual examples with lots of code. I wanted to write something that you could easily learn from, without all the rigor and detail of mathematics associated with college level computer vision and image processing courses. You don’t need a degree in computer science or mathematics to understand the examples in this book. 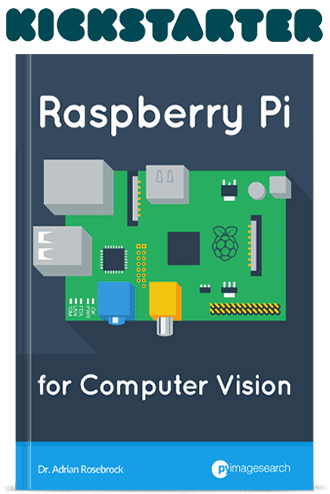 This book is aimed at developers, programmers, and students who are interested in computer vision and image processing, but still need to learn the basics. It covers the fundamentals, with tons of code examples that allow you to get your hands dirty, quickly and easily. 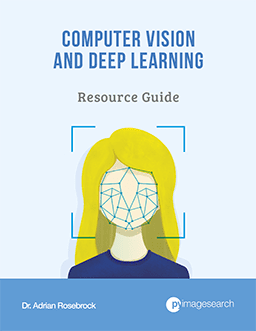 Whether you are a seasoned developer looking to learn more about computer vision, or a student at a university preparing for research in the computer vision field, this book is for you. 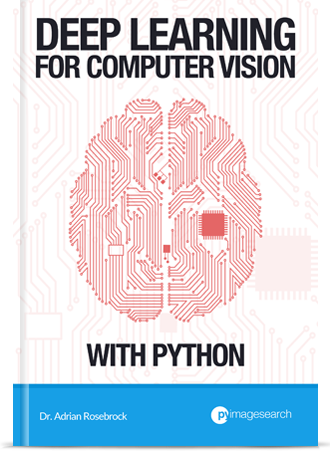 This book covers the fundamentals of computer vision and image processing using the Python programming language and OpenCV — the most used computer vision library in the world. In this book you’ll learn all about image basics, drawing, image transformations, such as translation, rotation, and resizing, image arithmetic, masking, histograms, smoothing and blurring, thresholding, edge detection, and contours. And again, all these topics are covered with lots of example code with the single goal of getting you up to speed as quickly as possible. This is seriously the quick start method! I recognize the fact that setting up your development environment (and even compiling and installing OpenCV) isn’t the most fun thing in the world. Not to mention that it’s also quite time consuming. In order to get you learning as fast as possible, I have created a downloadable VirtualBox virtual machine that has all the computer vision and image processing libraries you will need pre-installed. No work on your part! Just fire up the virtual machine and start learning! Sign-up to receive an awesome pre-release deal when the book launches.